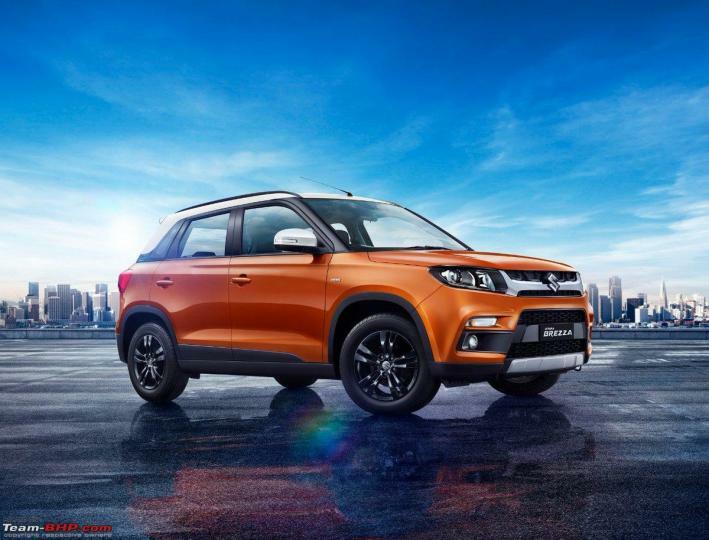 According to a media report, Maruti Suzuki is likely to offer the Vitara Brezza with a new petrol engine. This is the same 1.5-litre, 4-cylinder unit that powers the Ciaz and Ertiga and is expected to feature Suzuki's Smart Hybrid tech. The 1.5-litre, 4-cylinder was introduced in the Ciaz last year as a replacement for the 1.4-litre unit. The engine produces 103 BHP @ 6,000 rpm and 138 Nm @ 4,400 rpm. In the Brezza, it could be paired with 5-speed manual and 4-speed automatic transmissions. Maruti was reportedly considering the 1.0-litre BoosterJet petrol engine from the Baleno RS for the Brezza. However, it was found to be more expensive and less fuel efficient. The Brezza 1.5 petrol will not qualify for the excise duty sops extended to sub-4 metre cars with engine capacities under 1,200cc. This means it could cost more than some of its rivals. Maruti is also likely to swap the old Fiat-sourced 1.3-litre diesel engine for an in-house developed 1.5-litre unit that produces 94 BHP @ 4,000 rpm and 225 Nm of torque @ 1,500-2,500 rpm. The new engine could be introduced in the Brezza later this year.